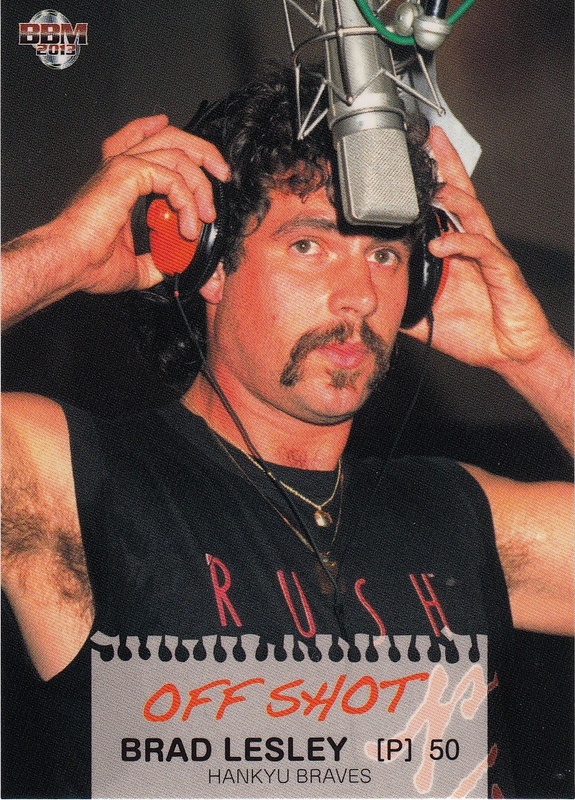 Brad "Animal" Lesley passed away last Saturday from kidney failure at age 54. 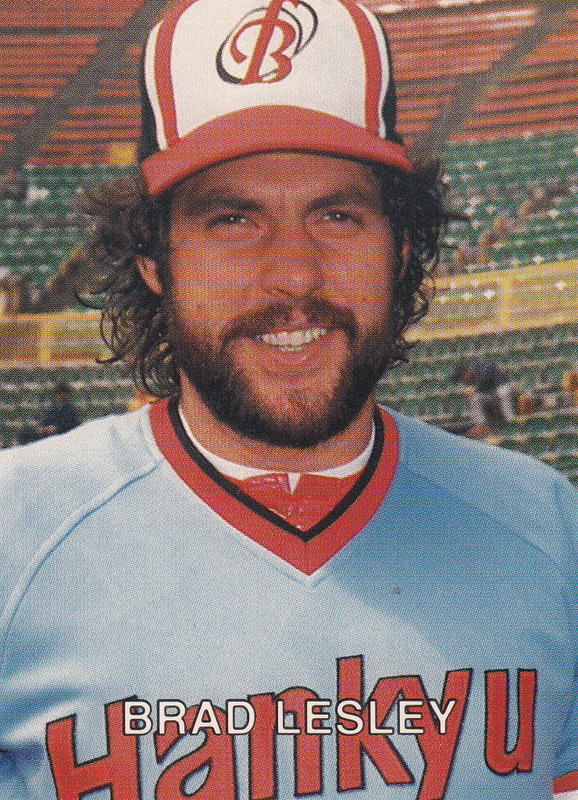 Lesley spent two years playing in Japan (1986-87 for the Hankyu Braves) and then spent a number of years as a character in a Japanese game show called Takeshi's Castle. He also did some acting in the early 1990's. 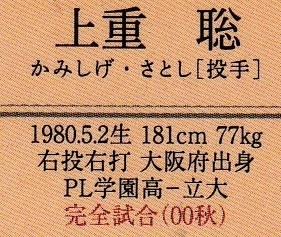 This one shows him on Takeshi's Castle. I figure that the Australian narration was added later. 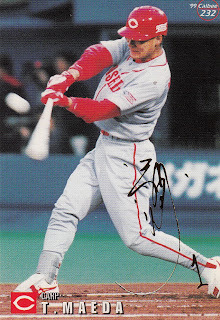 Tomonori Maeda of the Carp was hit by a pitch last week from Masaya Emura and broke his wrist. He had surgery on Thursday and will likely be out for three months. Maeda is 41 and there may be some question about whether or not he simply retires at this point. 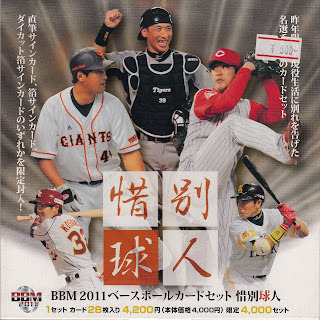 Here's video of the HBP (H/T Japan Ball Blog). The benches cleared, but I think the only actual fighting was when the Carp's pitching coach Kenji Furusawa went after Swallow's pitching coach Daisuke Araki. 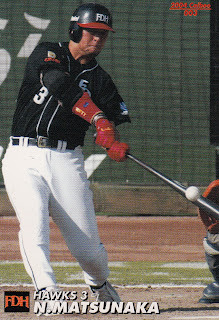 Furusawa was ejected. 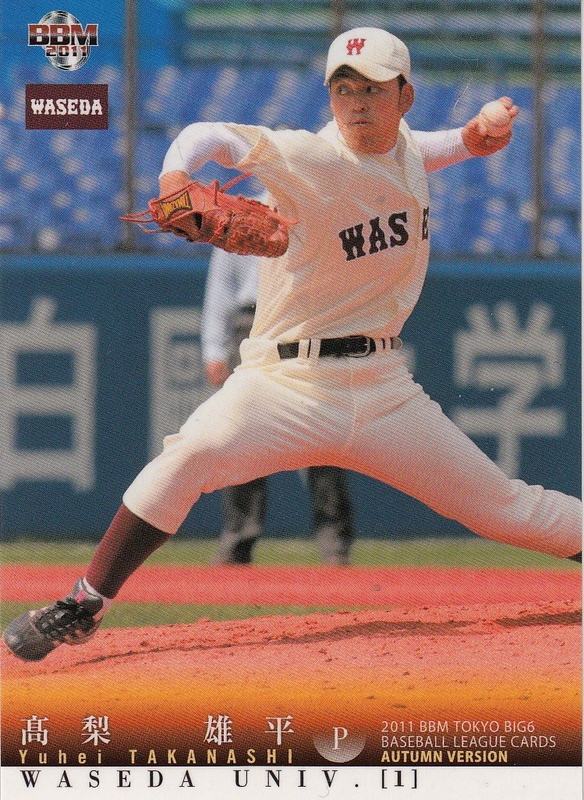 Deanna Rubin had a post up the other day talking about a perfect game thrown last Sunday (the 21st) in the Tokyo Big Six collegiate baseball league by Yuhei Takanashi of Waseda against perennially hapless Tokyo. So then I went through the other cards in the Legend Of Tokyo Big Six set to see if anyone else had that text on the back of their card (and there should be no more than one). 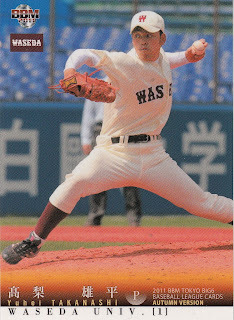 I found it on the card for a pitcher for Keio in the early 1960's named Taisuke Watanabe, who later pitched for Nankai from 1965 to 1972. 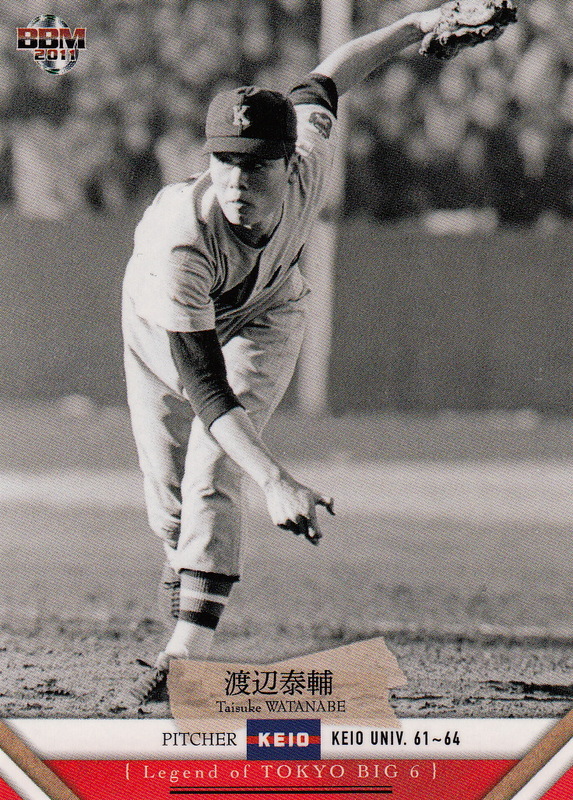 The line indicated that he pitched the perfect game in 1964. 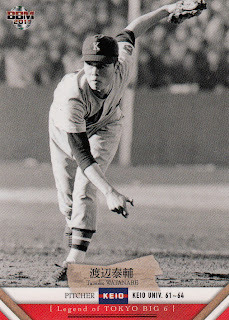 I checked out his bio over at Japan Baseball Daily's Data Warehouse and verified it - he threw the game on 5/17/1964 against Rikkio. 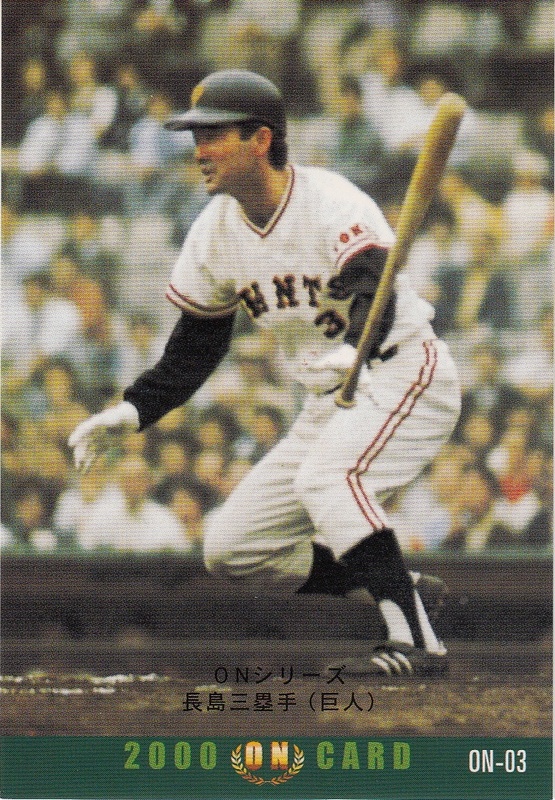 Watanabe's career falls perfectly into the black hole for Japanese baseball cards between the end of the menko era in 1964 and the beginning of the Calbee era in 1973. The only card (other than this one) of him that I'm aware of off hand is from the 1967 Kabaya-Leaf set (#303). The latest Prestige Collectibles Auction is running from now until May 7. As always, lots of cool vintage stuff available. On Thursday Dragons closer Hitoki Iwase notched his 350th career save. When asked by a reporter what was next, he said "number 351". 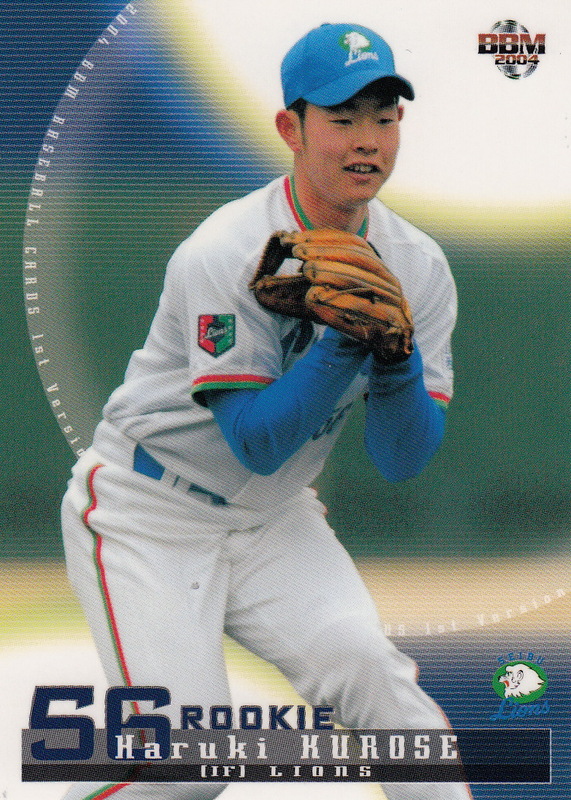 The Gary SouthShore RailCats of the independent American Association announced that they signed former Baystar and Fighter pitcher Takahiro Matsuka. 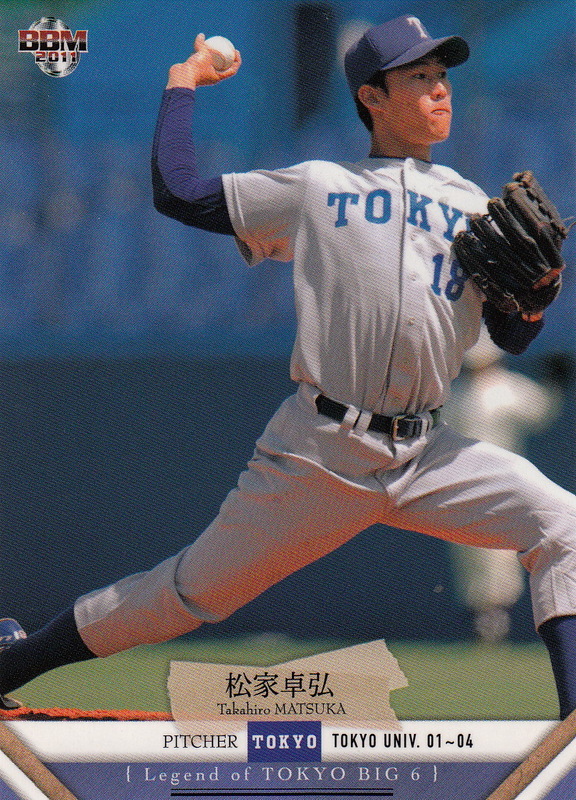 Matsuka was taken in the ninth(!) 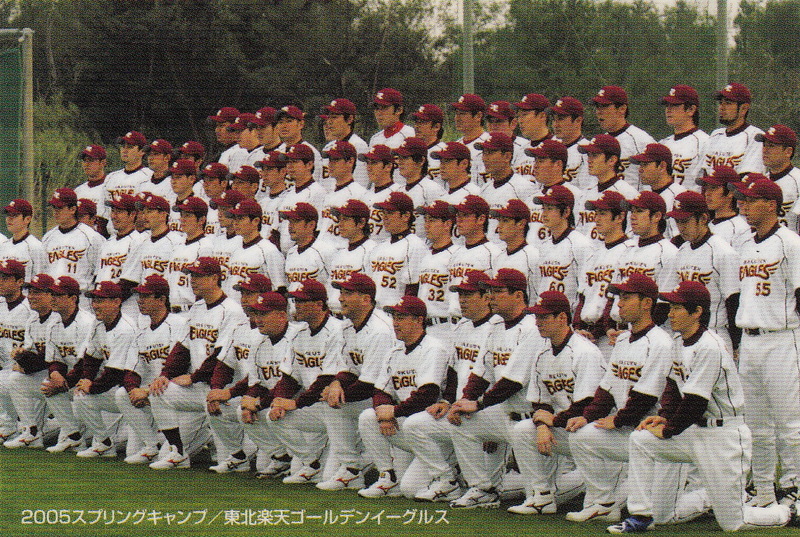 round of the 2005 draft* by Yokohama from Tokyo University. 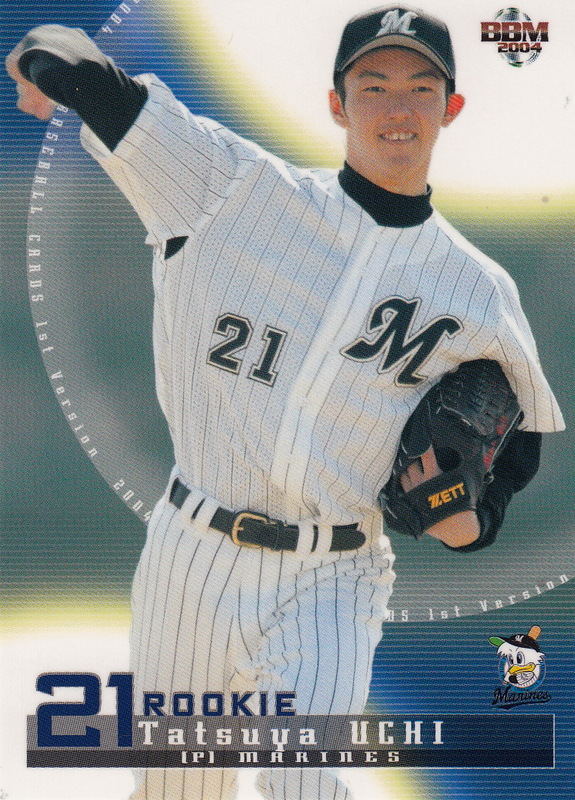 He only made 14 appearances at the ichi-gun level during his career in Japan - 9 with the Baystars in 2009 and 5 with the Fighters the following year. His complete stats are available here. 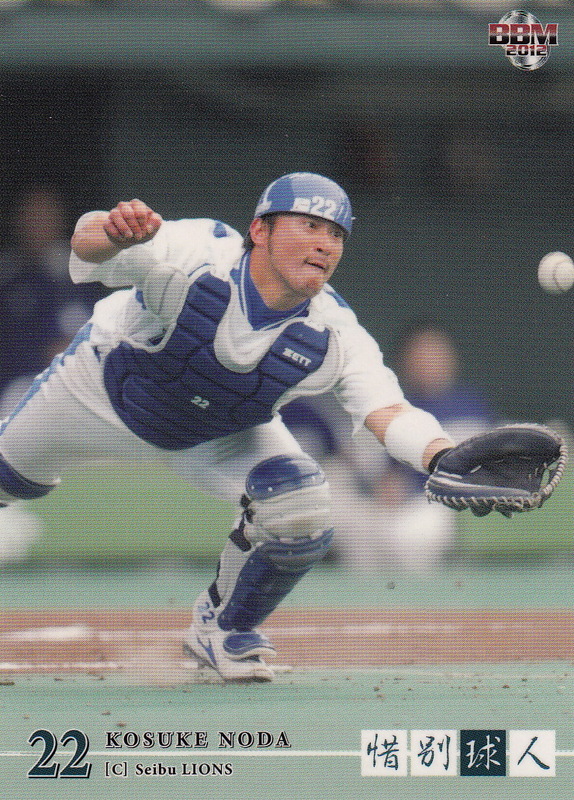 Matsuka doesn't have many cards and what he does have appear to all be BBM cards. His rookie card is #486 in the 2005 1st Version set although he also appears in the 2005 Rookie Edition set (#80). His only other appearance in one of BBM's flagship sets is in the 2010 2nd Version set, where he shows up in the 1st Version update subset (#749). 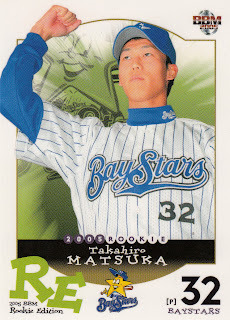 Most of his other cards are from the Baystars team sets from 2005 to 2009 and the Fighters team sets from 2010-2012. 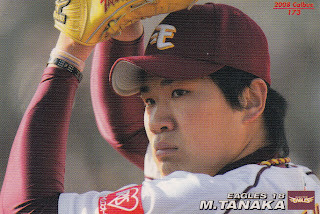 Two other cards of note - as one of the rare Tokyo University alumni to make it professionally in baseball, he shows up in both the insert set for the 2011 Tokyo Big Six Spring Version set that shows famous OB players for each team (#SP12) and the 2011 Legend Of Tokyo Big Six set (#099). BBM has released information on a boatload of sets in the last couple weeks. 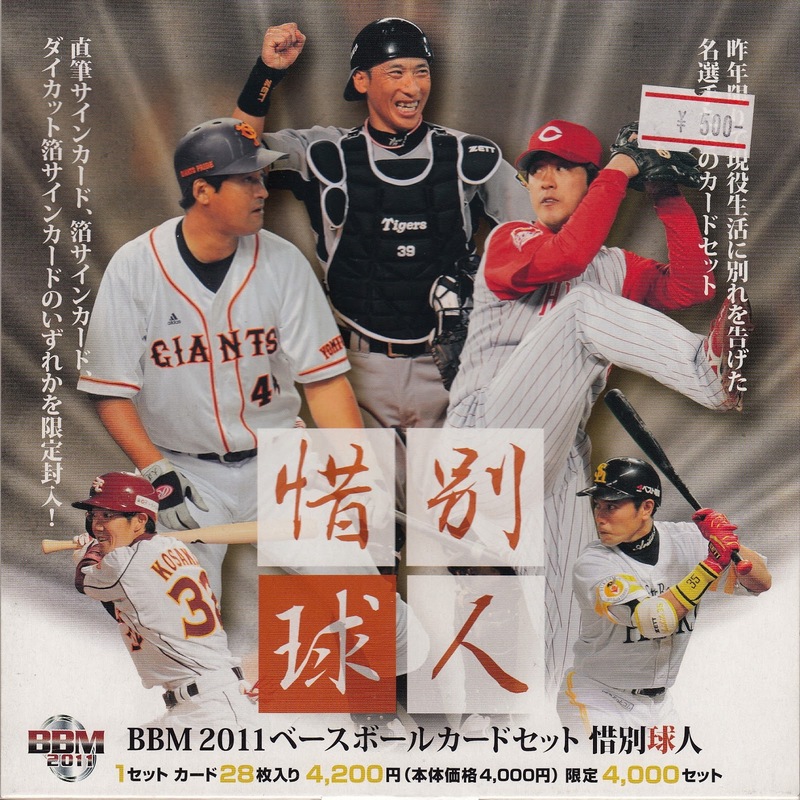 They've announced this year's team sets for the Baystars, Buffaloes, Carp, Giants and Marines. They are all pack based sets with base sets of 99 cards (except the Giants which has 108 cards) along with various inserts and memorabilia cards. The Baystars and Buffaloes sets will be out in late April. The other three will be out in late May. 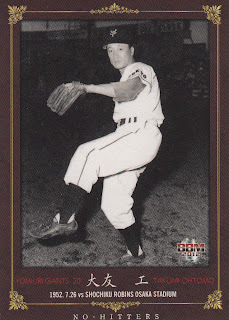 In addition, BBM announced two new OB sets - Tigers Legend and the Hawks 75th Anniversary set. The Tigers Legend set is a pack based set with 99 cards in the base set, a nine cards insert set (V-1985) and a bunch of possible autograph cards. From the promo sheet at Discount Niki's website, the design of the base cards looks very similar to the Giants Legend set from last winter. I think the theme for this set is players from the 1980's but I'm not sure. 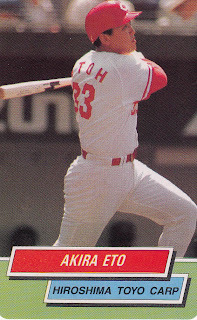 It looks like there's 90 "regular" player cards in the base set along with a nine card subset translating as something along the lines of "successive Legend". It will be out in early May. 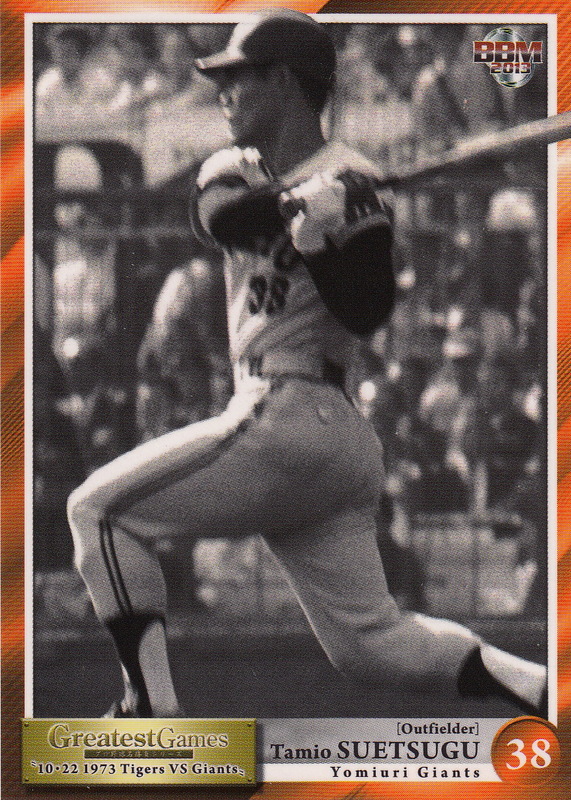 The Hawks 75th Anniversary set also has 99 cards in the base set along with a nine card insert set (Honors List?) and various autograph cards. The 99 base set cards break down along the standard Anniversary set lines - 5 cards "Hawks Memories" subset, 67 OB Hawks cards, 18 current Hawks cards and 9 cards that appear to show different uniforms over the years. 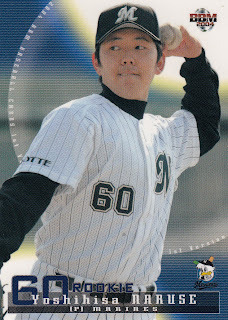 The big news about this set is that Katsuya Nomura will be appearing in it - he was not included in the Hawks 70th Anniversary set that BBM put out in 2008 and he doesn't appear in BBM's OB sets very often. The set will be released in late May. A set that BBM kind of snuck out with little fanfare in the last two weeks is this year's Tokyo Big Six set. It's a 37 card box set featuring 36 "regular" cards and one special card - either an autograph or an insert (Tokyo Big Six Heroes). 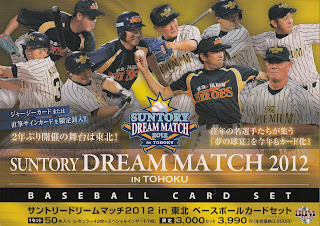 The base set is evenly divided among the six teams - five player cards and a team card for each. The set is actually already out and all the regular cards plus a couple of the inserts can be seen here. BBM apparently decided that having the team cards in the 1st Version set feature mascots for the fourth time in the last five years wasn't enough - they've announced the return of the Our Friends set from 2011 which featured all the mascots for all the teams. It's a pack based set with 81 cards in the base set along with parallel "kira" cards and autograph cards. It'll be out in late May. 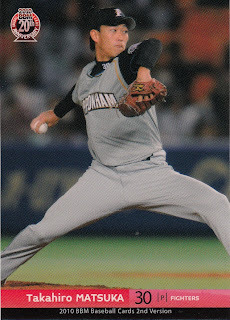 I've kind of forgotten to check to see what Topps has up it's sleeve in the way of cards for this year's World Baseball Classic. So far, I've found information on only two sets. The first is a small (15 card) insert set in the upcoming Topps Series Two set. I haven't found a checklist so I don't know who's included. Topps will be releasing Series Two on June 12. 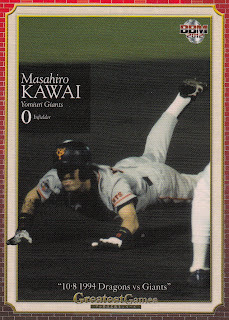 The other set is called Topps Tribute World Baseball Classic Edition. There's a 100 card base set and a ton of autograph and memorabilia cards. The base set will include 15 players from the Japanese team - Masahiro Tanaka, Kenji Otonari, Hayato Sakamoto, Tadashi Settsu, Takeru Imamura, Yuichi Honda, Toshiya Sugiuchi, Kazuo Matsui, Hideaki Wakui, Shinnosuke Abe, Atsunori Inaba, Tetsuya Utsumi, Atsushi Nohmi, Kenta Maeda and Nobuhiro Matsuda. 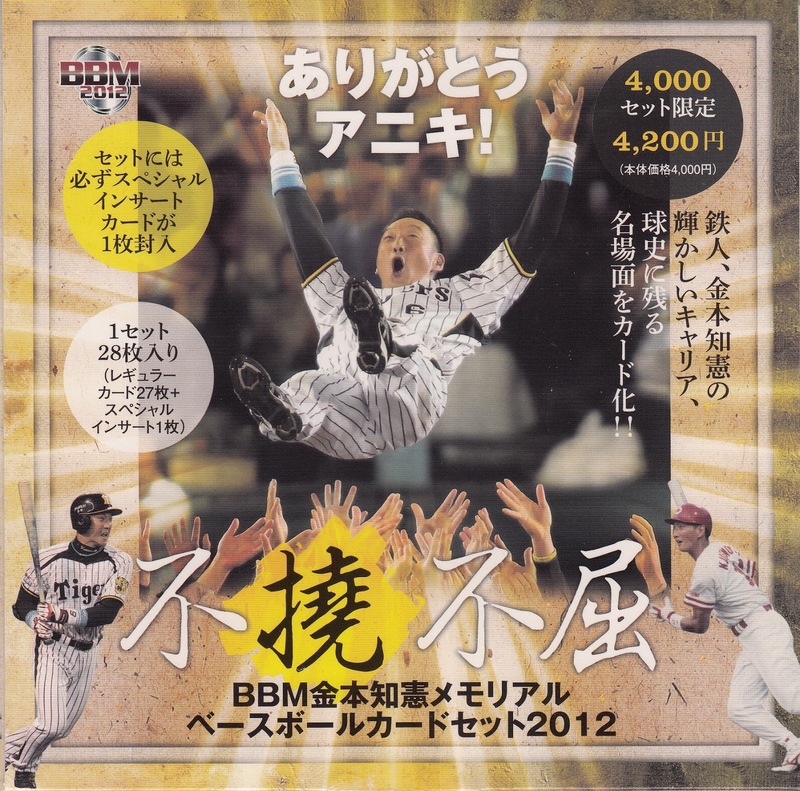 It will be released on June 26. I wanted to briefly talk about the eight opened box sets that I bought while in Japan. The original, unopened sets have the possibility of containing some form of memorabilia or autograph card. So these were sets that were opened and had those special cards removed and were therefore a fraction of the cost of the unopened versions. Since I'm really not all that interested in insert or memorabilia cards (at least not enough to pay for them), these were perfect for me. 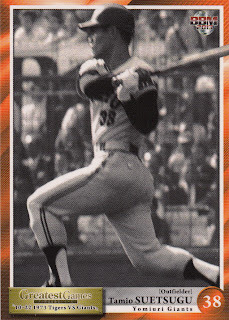 Since all of these sets are fairly recent, I've included a link to Jambalaya's web page for each set so you can see what all the cards in the set look like (although I'm also showing a sample card from each set). For each year from 2002 to 2010, BBM would include a subset for players who retired the previous season in either the 1st or 2nd Version sets (or both). 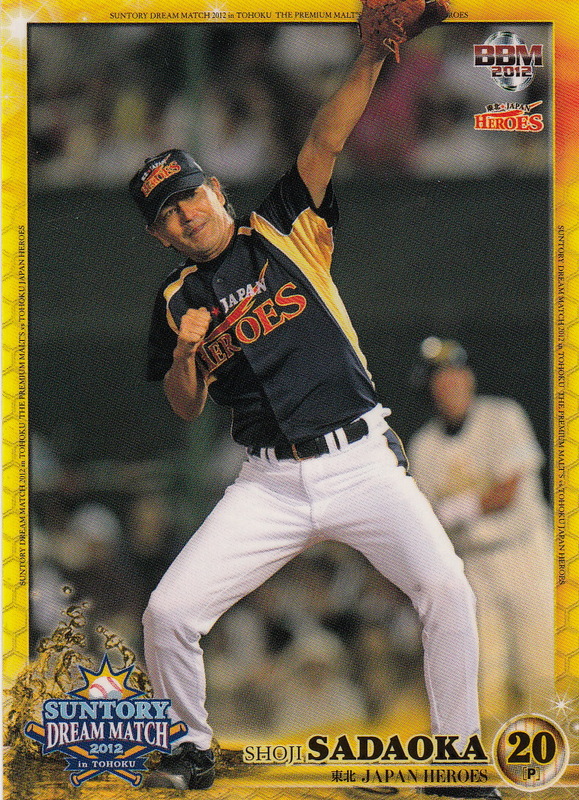 The subset was usually fairly small (less than 10 cards) and frequently had some somewhat noticeable absences (no Tsuyoshi Shinjyo in 2007 or Kazuyoshi Tatsunami in 2010 for example). Starting in 2011, BBM moved this subset into its own, somewhat larger and more complete box set. I'm not entirely sure what the name of the set is - I've been calling it the "Farewell" set but it's probably more like "Farewell Heroes". Certain players in the sets might end up with multiple cards - usually depicting the player with different teams. I think the most I've seen any player end up with is 3 cards in the set. 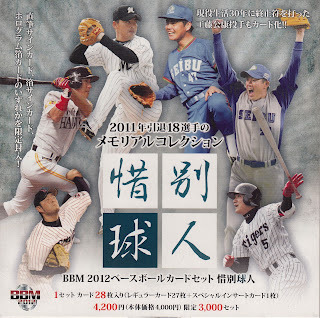 The 2011 edition of the set featured 14 players on 27 cards. There were multiple cards for Kazuo Fukumori (Baystars, Buffaloes and Eagles), Koichi Hori (Orions and Marines), Makoto Kosaka (Marines, Giants and Eagles), Arihito Muramatsu (Daiei Hawks, Blue Wave, Softbank Hawks), Noriyoshi Ohmichi (Nankai Hawks, Daiei Hawks and Giants), Ken Takahashi (playing and do-age), "Yuki" Tanaka (Buffaloes and Swallows) and Akihiro Yano (Dragons, Tigers and do-age) as well as single cards for Atsushi Kizuka, Shigeru Morikasa, Masanobu Ohkubo, Akira Ohtsuka, Makoto Shiozaki and Shinji Taninaka. The 2012 version of the set also featured 27 cards, but this time featuring 18 players. 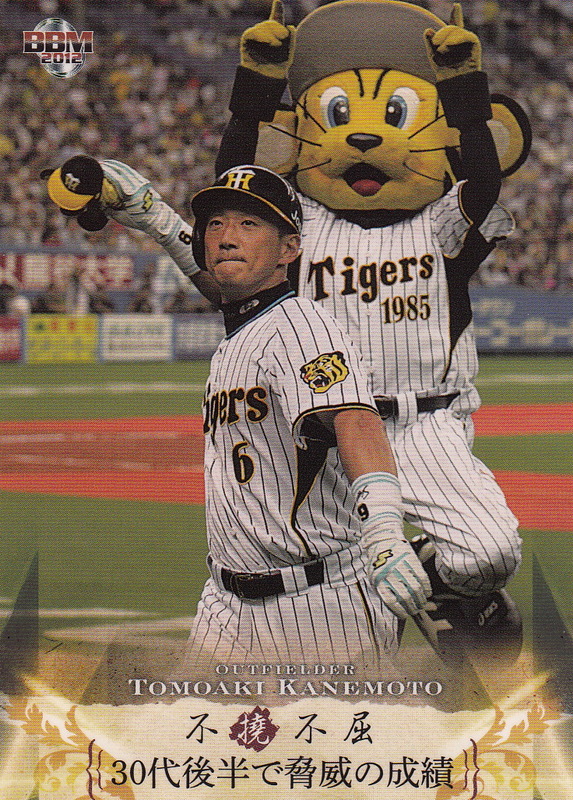 There were multiple cards for Osamu Hamanaka (Tigers and Buffaloes), Daisuke Hayakawa (Buffaloes and Marines), Hirotoshi Ishii (playing and retirement ceremony), Satoru Kanemura (Fighters and Tigers), Hidetaka Kawagoe (Buffaloes and Marines), Masahide Kobayashi (Marines and Giants), Shinya Okamoto (Dragons and Lions), Hiroshi Shibahara (Daiei and Softbank Hawks) and Kiyoshi Toyoda (Lions and Giants). Oddly, there was only a single card devoted to the 29 year career of Kimiyasu Kudoh (shown with the Lions in the 1980's). The other players included on only one card were Yosuke Hiraishi, Takeharu Katoh, Daisuke Maeda, Satoru Morimoto, Kosuke Noda, Hiroaki Ohnishi, Masaumi Shimizu and Shinji Shimoyama. 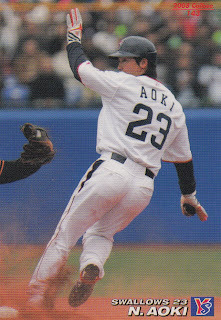 There were some fairly significant players to retire at the end of the 2012 season and the 2013 version of the Farewell set expanded to 41 cards to accomodate this. 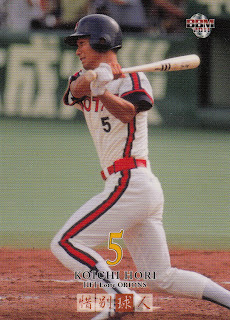 There are 37 players represented in the set and only the four really big names ended up with multiple cards (2 each): Takuro Ishii, Kenji Johjima, Tomoaki Kanemoto and Hiroki Kokubo. I won't list all the other players included this time, but some of the more prominent names are So Taguchi, Shingo Takatsu, Michael Nakamura, Ryuji Miyade and Makoto Imaoka. Despite the accidental purchase, it's not a bad little set (as the single player sets go). It contains 27 cards. The first 18 cards show highlights of his career (5 with the Carp and 13 with the Tigers) and the last nine are entitled "9 Episodes of Kanemoto" - not really sure what that means. The photography is the typical high quality photography that BBM features in their sets. Unfortunately, the next couple sets I'm going to discuss feature unusually poor photography for BBM sets. Last fall, BBM started a new series of box sets dedicated to "Greatest Games". 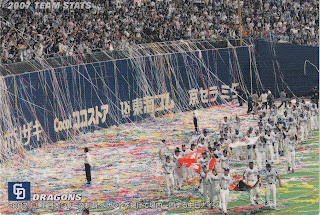 The first set celebrated the final game of the 1994 season (played on October 8) between the Giants and the Dragons in Nagoya. The two teams were tied for first going into the game, so the winner was going to the Nippon Series and the loser was going home (this being in the pre-Climax Series days). Spoiler alert - the Giants won. 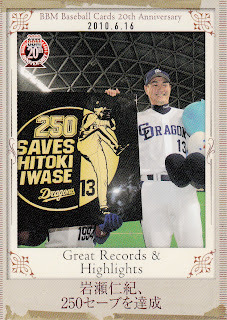 The set features 36 cards - there are 17 cards for Dragons players (including manager Morimichi Takagi), 14 cards for Giants players (including manager Shigeo Nagashima) and five game highlight cards. 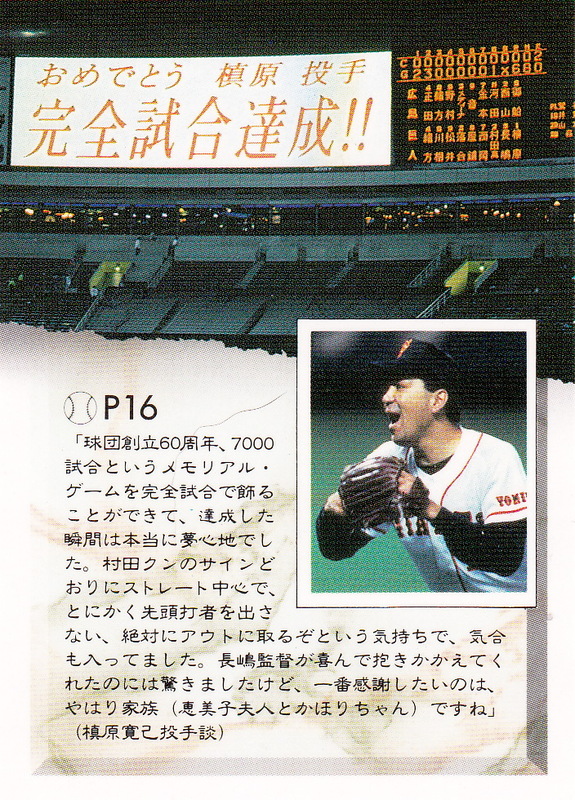 I think all the pictures on the cards were taken at the game itself and that's one of the problems with the set - the photos are terrible. They are very dark and a lot of the player's faces are in shadow. 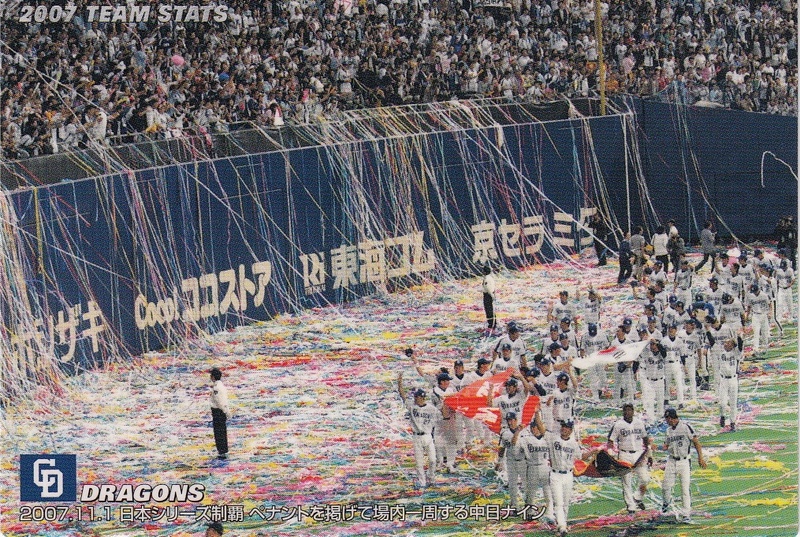 I assume the game was a night game and it was not played indoors (the Dragons didn't move into Nagoya Dome until the late 1990's) so this probably accounts for the poor photography. 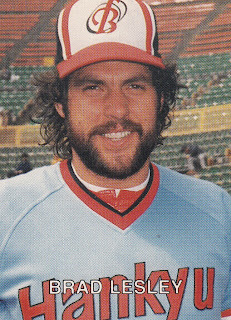 In addition, the player cards have a couple ugly borders - a white frame onto of a "brick wall" background. It's just not an attractive set. 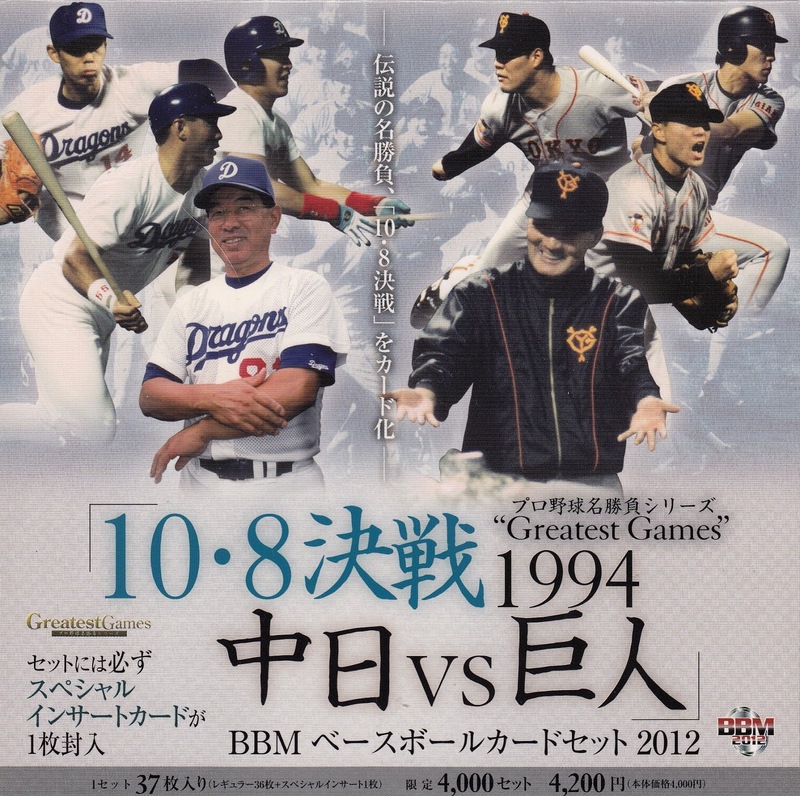 The second "Greatest Games" entry suffers from much the same issues as the first set. 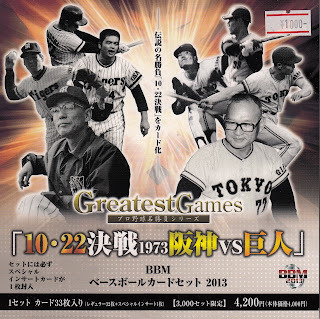 This one commemorates the final game of the 1973 season between the Hanshin Tigers and Yomiuri Giants. 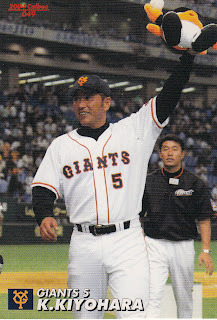 The Giants victory clinched their ninth straight Central League pennant by putting them a half game ahead of the Tigers . 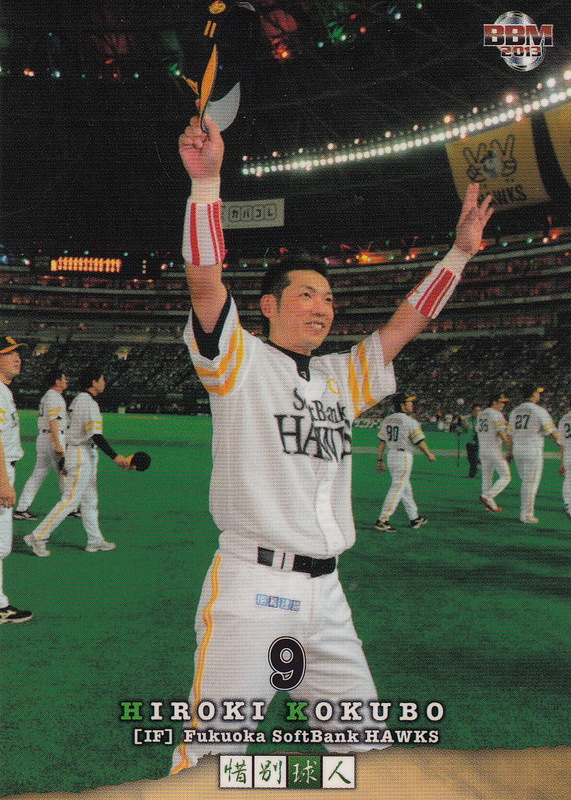 This would be the final Central League pennant for the V9 Giants and for manager Tetsuharu Kawakami. At 32 cards, the set is slightly smaller than the first one. There are 18 cards for the Tigers players (and manager Masayusa Kaneda), 10 cards for the Giants players (including Kawakami) and four "Game Highlight" cards. The photos are all black and white and it's not clear if they were actually taken during the game or not. Several of the photos are blurry. The "Game Highlight" cards don't actually show any action from the game - one card shows the starting lineups on the scoreboard at Koshien stadium, one shows Shigeo Nagashima with a cast on his finger - he was injured and did not play in the game or the Nippon Series, one shows two Giants coming off the field with photographers behind them and one shows Kawakami's do-age (which looks like it's being done in a locker room so they couldn't have thrown him very high). The cards also have an ugly frame on them. So like the first set, this is not an attractive set. The set itself had been released just a week or two before I got to Tokyo, so finding an opened set was a little trickier than the others - it wasn't until I got to Wrappers that I found one. Despite the 1000 yen price tag on the box, I think I only paid 500 yen for it. One interesting piece of trivia - October 22, 1973 was also the day Ichiro Suzuki was born. 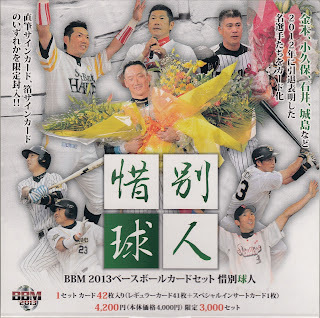 Last August, Suntory Brwery sponsored another old timer game, this time played up in Sendai as a benefit for earthquake relief. 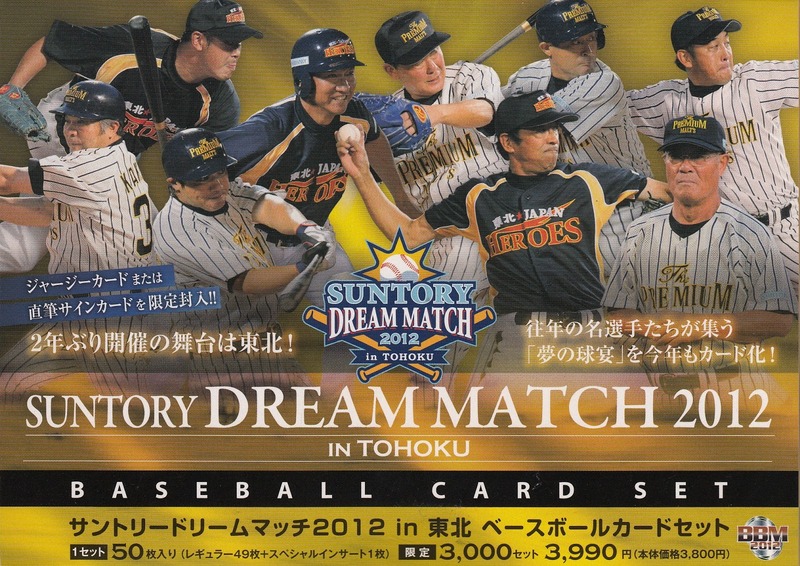 The set contains 49 cards for the players who actually appeared in the game between the Premium Malts and the Tohoku Japan Heroes. 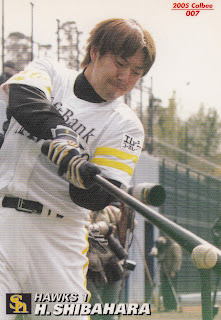 Some of the bigger names in the set include Randy Bass, Isao Harimoto, Osamu Higashio, Masayuki Kakefu, Shinji Sasaoka, Koji Yamamoto, Norihiro Komada, Masumi Kuwata and Yasushi Tao. It's not a bad little set - I don't like the borders on the cards but the photography is nice. This is the third Premium Malts set and I'm actually not sure there's anyone who shows up in this set that hasn't shown up in the previous ones. If you already have one of the others, there's really no compelling reason to pick this one up. 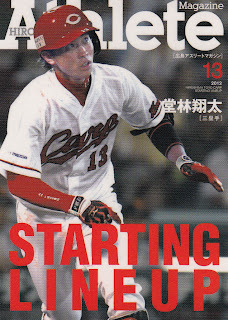 To end this on a higher note, the final opened set I picked up was the first set from Hiroshima Athlete Magazine. 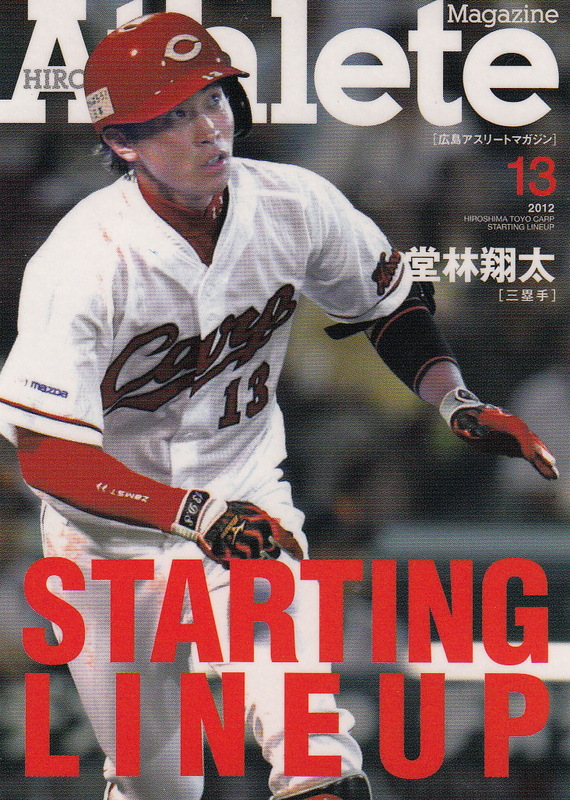 It's called "Starting Lineup" and it exclusively features the Hiroshima Toyo Carp. The set contains 27 cards - 14 player cards, four cards for 2012 Carp rookies (including Yusuke Nomura), six cards for Carp prospects and three cards for the three guys on the 2012 Carp roster with 2000 hits - Takuro Ishii, Tomonori Maeda and manager Kenjiro Nomura. 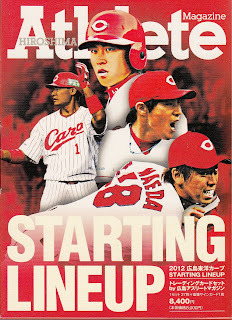 It's an attractive set - the design of the player cards resemble a magazine cover. I've seen previews that Hiroshima Athlete Magazine is going to put out another set featuring OB Carp players. I'll be looking forward to seeing what they do. This week I thought I'd show off some more cards I picked up in Japan. 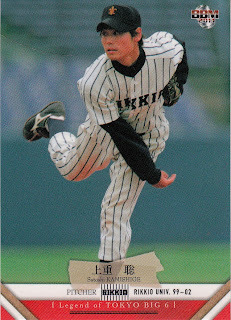 There's a couple years that I don't have many Calbee cards from, so I wanted to add some cards from those years. 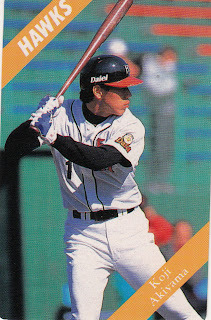 Luckily, several of the stores I went to had ample collections of Calbee singles for me to pick from. 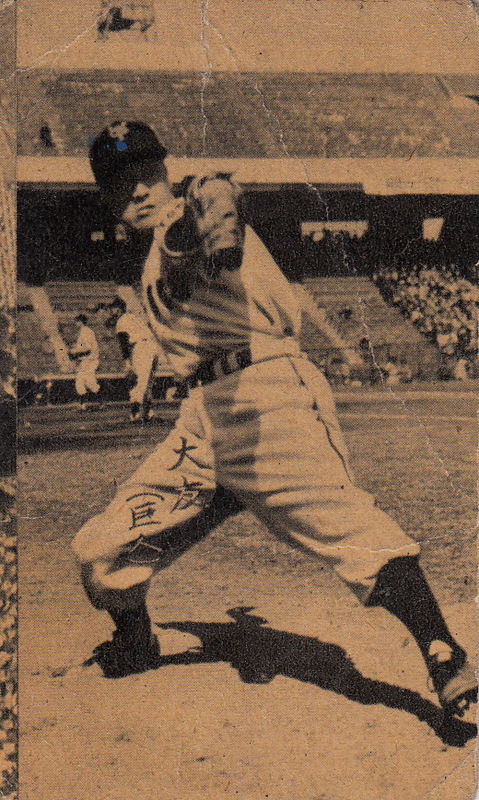 Former Yomiuri Giants and Kintetsu Buffaloes pitcher Takumi Ohtomo has passed away at age 88. 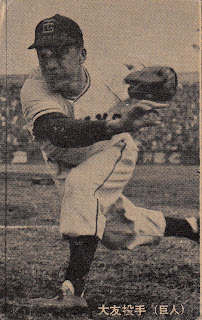 Ohtomo played for the Giants from 1950 until 1959, then spent 1960 with the Buffaloes. I think the first card is uncatalogued. The photo appears to be from 1953 as that was apparently the only year the Giants used that hat logo. The second card is from the 1956 JBR29 bromide set. 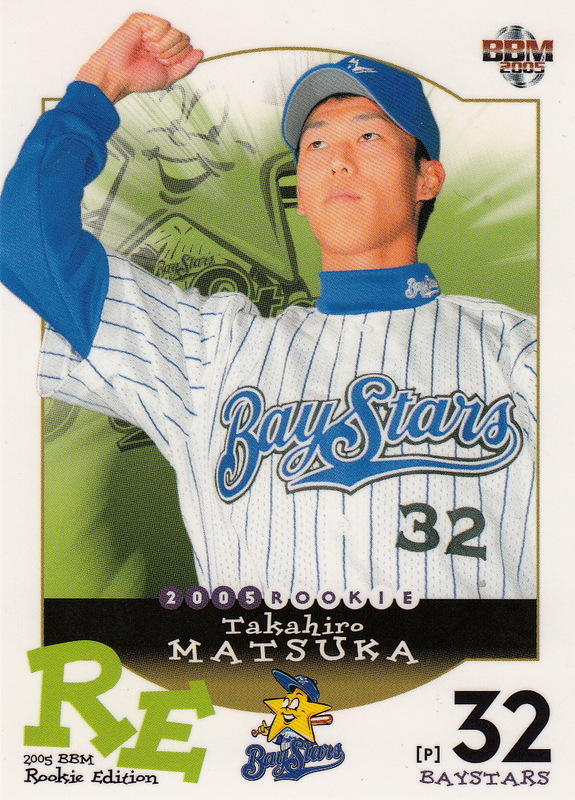 A quick check of SportsCardForum's Inventory Manager also shows that he had a card in the 2004 BBM Giants 70th Anniversary set (which I'm actually waiting for from kuboTEN). The final store I went to in Japan was Mint's store in Yokohama. 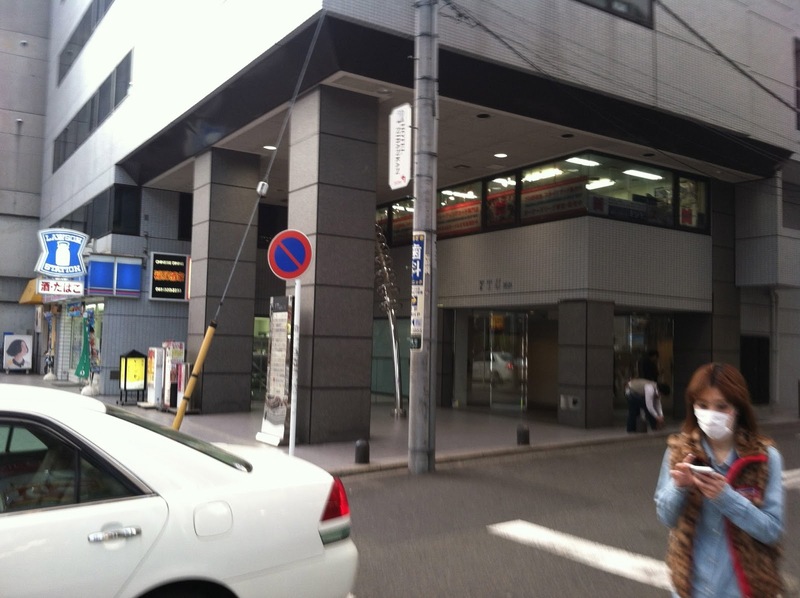 This store is located on the second floor of a building about four or five blocks north of Yokohama station. The store itself reminded me quite a bit of the Mint Kanda store. 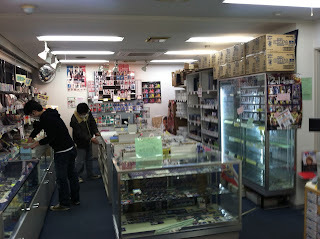 It was a small, run-of-the-mill card shop, well organized and selling singles, sets and unopened product. The two guys working at the shop were quite helpful despite their limited English my inability to speak Japanese. Unfortunately, they didn't have any of the cards that I was looking for. 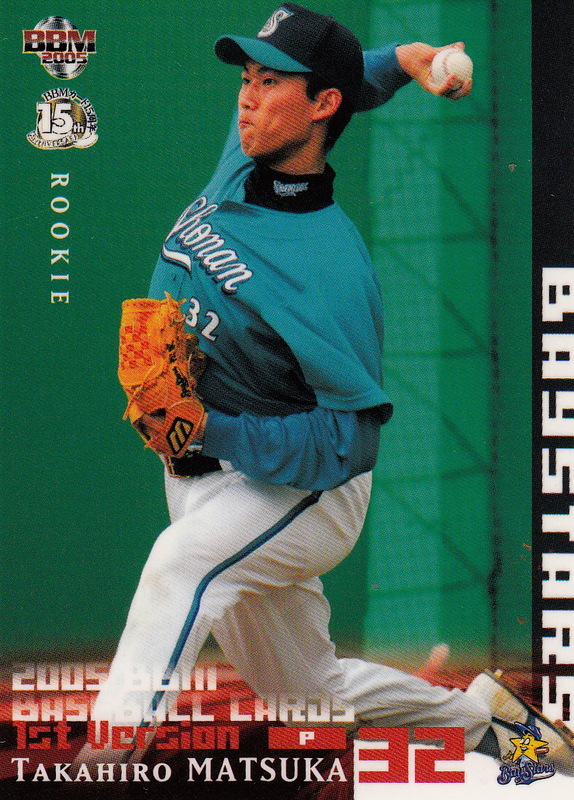 They were in the middle of sorting the just released Calbee cards, so if there had been a single I was looking for, I'm sure they would have sold it to me. Since I was looking for a complete set, they couldn't help me. So that was it for card shops. I considered attempting to go to Mint Urawa on that particular Wednesday evening since it looked like the train I was taking from Yokohama would go right to Urawa station, but while sitting on the train, I read this post from Ryan and realized that the store was closed on Wednesdays (which I think the guys in Mint Yokohama were trying to tell me). 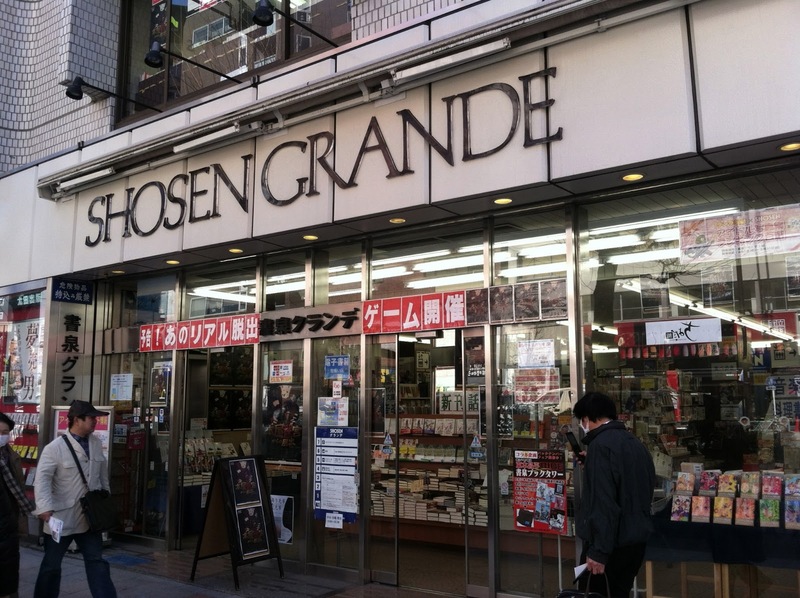 I looked up a couple other stores that Ryan had been to east of Tokyo, but ultimately I decided that it just wasn't worth the time it would take to get to any on the stores. 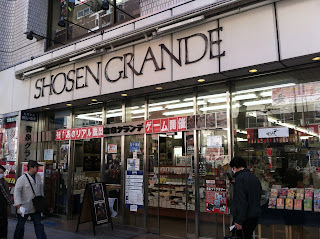 One other place I want to mention real quick is a bookstore in Jinbocho that's just a few blocks from Biblio - Shosen Grande. 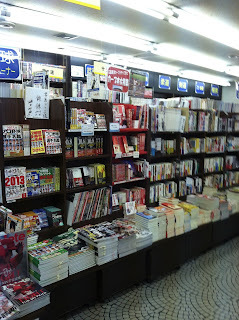 Rob Fitts had told me about this place after I told him that the Tokyo Dome bookstore he recommended had closed. 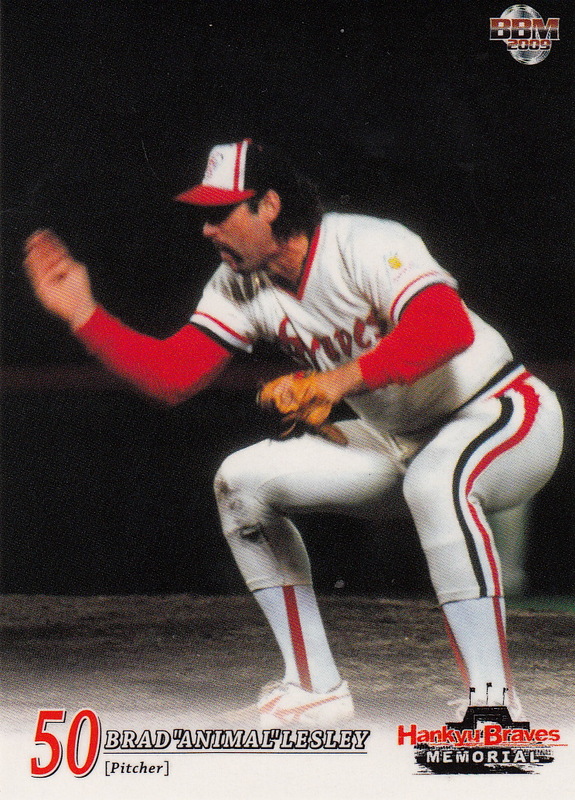 They had a nice selection of baseball books down in the basement, along with packs of the most recent BBM sets. 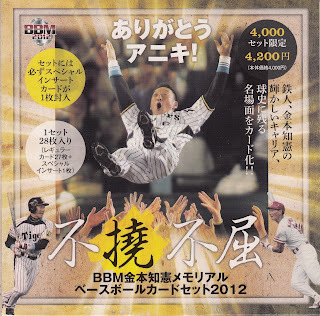 I picked up a couple magazines put out recently by BBM - one on the Nankai Hawks and one on the Hakyu Braves. 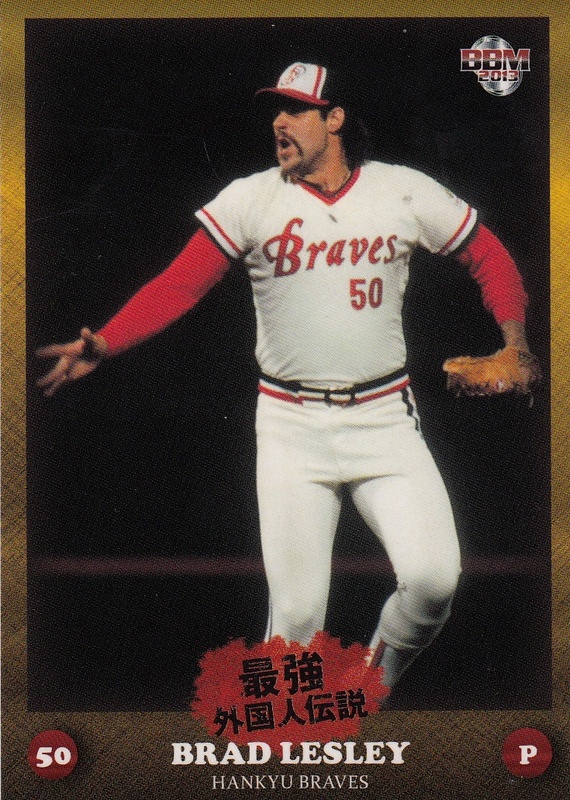 I didn't realize until I was looking at the magazines that evening that the Braves magazine contained some promo cards for the 2011 BBM Legend Of The Bs set. Obviously my lack of ability to read Japanese limited the attractiveness of any reading material to items with a lot of pictures. In doing these write ups on the stores, I have realized two things - since I was specifically looking for singles from some specific BBM sets, I have a somewhat skewed view of what each store really had to offer. The other thing is that there were a couple stores that I really went through quickly and I'm really grateful that Ryan was nice enough to put up with me hurrying him along. Going into this trip, my impression was that Mint Ikebukuro was the best card shop in Tokyo. After visiting these stores, I think they're tied with Quad Sports and Wrappers for the best. Biblio, while amazing, is pretty much in a class by themselves. Coletre and Mints Kanda and Yokohama are fine stores, but were I to do this trip over, looking for the same cards, I'd hit those first three stores first (actually, I did hit two of them first). G-Freak I'd go back to if I had a couple hours to just browse boxes but I'd probably skip Niki and Mint Akihabara. I will say, though, that Ryan has spent much more time at all of these stores and I'd defer to his experience and recommendations. 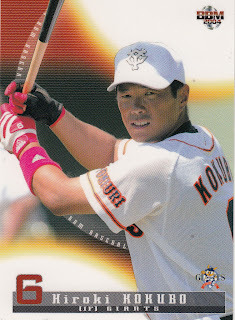 I bought these cards from Scott Kaneko, who sells Japanese cards on eBay under the handle skaneko. Prior to my trip to Japan I had considered sending Scott my entire want list, but I was holding out hope that I'd be able to trade some of the dozens of doubles I had for the cards I needed. And obviously once I was planning the trip to Japan, my hope was that I'd find everything there. 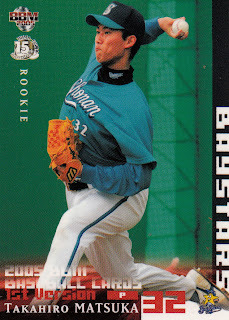 But luckily, he was able to help on the final four cards (and one of the two 2005 BBM 1st Version cards that I needed as well). So, thanks for the cards Scott! Scott can be reached via email at scottkaneko@yahoo.com.